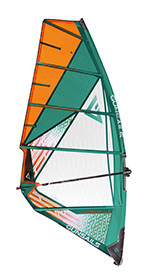 The Horzion is new to the Gunsails line-up for 2019, said to combine characteristics of two of its predecessors – the Transwave and Peak. Classed as their ‘power wave’ option, it possesses five battens through its nine-size range (3.7-6.1m) and exclusively uses x-ply throughout its panels, bar the Dacron luff panel to cushion the power delivery. Rigged for test on a 100% Select RDM (although said to also be compatible with SDMs), it sets with a little more luff curve than most here, the lower two battens retaining good rotation around the mast. Tuning is made simple by referring to FRED (standing for Fast Rigging Easy Doing) – Gunsails’s visual trimming guide located in the upper panel. Downhaul until the looseness reaches FRED, before fine-tuning using the two clew eyelets – the top one for power or the bottom for control. What could be simpler? In doing so, the leech falls away down to the batten above the boom, whilst the profile displays a moderate amount of shape forward in the draft. Detailing on the Horizon is functional, with many of the features you’d expect of a modern sail, such as a mesh pocket integrated into the tack fairing, a strap to hold the rolled sail together, and a multitude of guards and abrasion pads to reduce wear. Some of the very latest developments in sail design aren’t present in the Horizon. For example, the batten pockets alternate from side to side rather than being integrated into the sail’s panels. 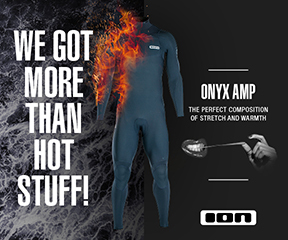 But then with retail price significantly under any of its rivals, you can’t have it all your own way! The Gunsails pro rider team boasts some notable names amongst their ranks, so we were intrigued to use a sail from the Gunsails loft for the first time. Using the upper clew eyelet, the Horizon feels larger than its quoted area in marginal winds and creates a good deal of bottom end grunt, the centre of effort low and forwards in the draft. There’s a lot of movement in the luff sleeve, which coupled with the Dacron luff panel enables the sail’s profile to grow into a much more purposeful shape as the wind increases. With its five batten outline and geometry, the Horizon does feel more of a high-wind freeride / freemove contender, rather than a loose and neutral manoeuvre specialist, when compared to others in the group. It encourages a more locked in stance and would be a great companion for coastal bump and jump, or making the most of less than ideal wave arenas. With balanced handling and a dependable delivery, it copes superbly with violent gusts, the lower clew eyelet always available should the conditions continue to become more severe. Speed and upwind drive are real assets of the Horizon, both well received when stuck on the inside of a cross-onshore spot. On the wave it does try to go neutral as it is eased out, the battens pushing back round the mast as the draft depth reduces. Ultimately, it feels a little heavier and stiffer than some, which is to be expected, but given its cost, the performance on tap is certainly impressive. 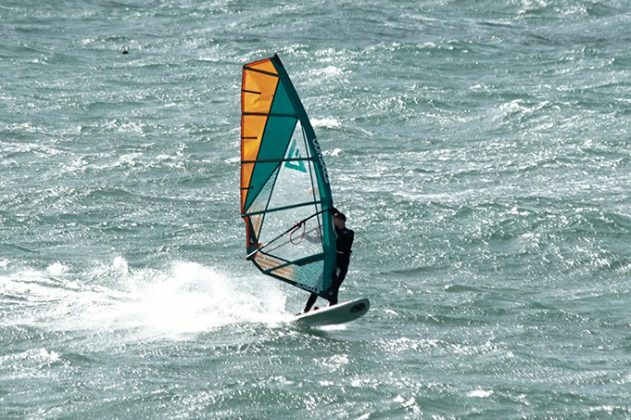 Representing excellent value for money, the Horizon provides assured, dependable power and real practicality for everyday coastal use, from high wind blasting to tackling tough cross-onshore wave spots.